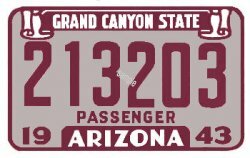 1943 Arizona Registration/Inspection Sticker - $20.00 : Bob Hoyts Classic Inspection Stickers, Add a Final Touch to your Restoration! This Arizona Registration/Inspection sticker was issued in 1943 to verify the 1942 Registration since no plates were issued during the war. The car was checked before the plates were issued for lights and horn so was actually both a registration and inspection sticker. We will pay a reasonable price for any original sticker not displayed here. For an additional $10.00 we will place the license plate number of your antique car on this sticker.